Have you ever visited the famous Four Faced Buddha of Erawan Shrine in Bangkok? This is one of the most famous tourist spots in Bangkok and is always filled with visitors from all over the world! This was my second time here, the first time being many, many years ago. 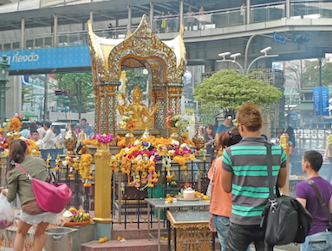 After spending some time shopping at MBK Shopping Mall and Siam Paragon, my friend and I decided to visit Erawan Shrine by walking instead of sitting the Skytrain. It was about 5pm and the traffic was getting heavy. Hmmm, I noticed that taxis in Bangkok were mostly Toyota Camry models! 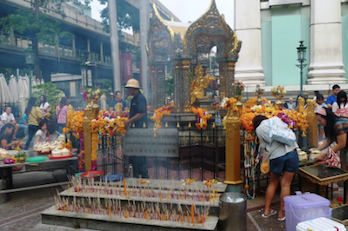 After a short 15 minutes walk, we reached the Erawan Shrine, also known as San Phra Phrom. 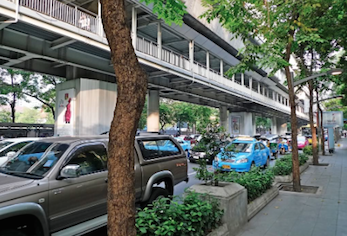 It is actually located at the heart of Bangkok, next to the Grand Hyatt Erawan Hotel, at the Ratchaprasong intersection of Ratchadamri Road and Sukhumvit Road. 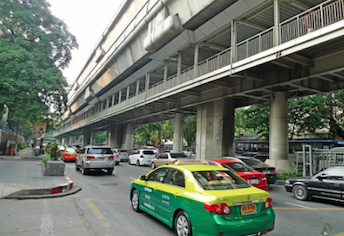 It is also very near to Skytrain's Chitlom Station which has an elevated walkway overlooking the shrine (as can been seen from the photo above). Directly opposite is Gaysorn Shopping Mall, which houses some of the world's best brands and within walking distance is CentralWorld Shopping Mall. In the middle of the shrine is the Four Faced Buddha, which is not really a Buddha but actually the Hindu creation God, Brahma. I wonder why they called it the Four Faced Buddha! Anyway, when we were there, we could see lots of people, both locals and foreigners, seeking blessing from the Four Faced Buddha. Each of the four faces of the deity are said to represent different elements. In a clockwise direction starting from the entrance, the first face represents the Face of Peace and Health, followed by the Face of Good Fortune, the Face of Good Relationships and the Face of Protection Against Evils. So did I pray while I was there? Of course I did since I was already there right? The only problem was I did not know the correct way of praying. I knew that I had to pray to all four directions but from which direction should I start first? And do I go clockwise or anti clockwise? Firstly, what we did was buy the candles, joss sticks and flowers from the stall inside the shrine. These were required offerings to be made to the Four Faced Buddha. 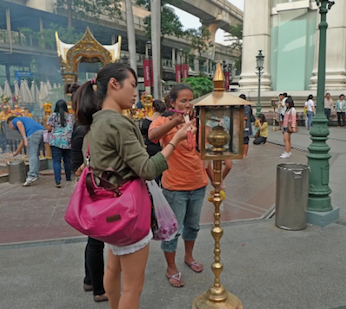 Then we lit up our candles and joss sticks (like what the lady in the photo above did). After that we prayed to the Four Faced Buddha, one side at a time until we covered all four sides. On each side, we placed the joss sticks and flowers as offerings. So did we do it right? I honestly do not know! Some people said you can start from anywhere and can go clockwise or anti-clockwise, it does not really matter. Well, I chose anti-clockwise for no reason whatsoever. Also, you must pray on one specific thing at each direction. For example, you might want to pray for good health at one direction, money and wealth at another direction, good relationships at the third direction and perhaps protection from evil people and evil forces at the fourth direction. When I came back home to Malaysia, a friend told me that the proper procedure is to state your name, birth date and where you come from before saying your wishes. Also, you must promise to return and give thanks and pay respect if your wishes were to come true. 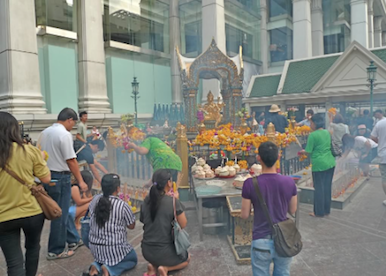 According to my friend, most of his friends who went to pray there had their wishes fulfilled and they were so grateful that they return to the Erawan Shrine year after year to give thanks! 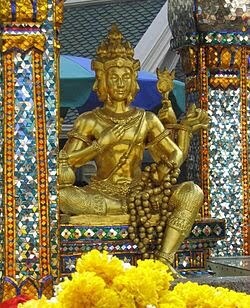 Whether you believe in this or not, I still think it is a good place to visit if you ever go to Bangkok. 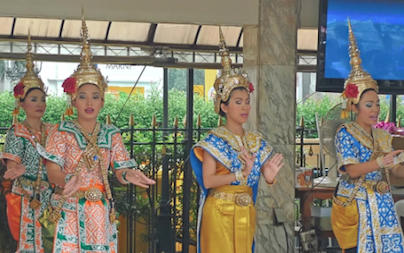 Besides, you can get to see performances by the resident Thai dance troupes! Yes, these are dancers paid by worshippers in return for having their prayers answered. 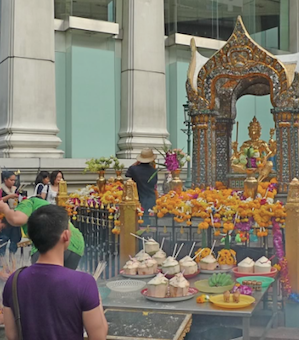 There seems to be an interesting story behind the creation of Erawan Shrine, how it came into being, why it was built and how the original statue deity was destroyed by a demented man and quickly rebuilt. Read more HERE. Wah really? So tell me later if ur wish came true okay? soyou mean if you failed to follow the proper procedure.. your wishes will not come true? The tradition is doing it clockwise. Why didn't you observe other people, or ask the joss stick seller? This shrine is always full of devotees. Do you know we have a 4-faced Buddha in PJ? Its unwise to go anti-clockwise haha..Also you must state you NRIC No as well there might be 1001 Pandaz wit the same name..*just kidding* lolz..
Agree this place is a 'must see' when you are in Bangkok. tQ for the pixz. i had that kind of buddha at my home n shop. eh in SG at Golden Mile also have this kind of shrine.. though i cant remember if it has four face.. but i always see Thais or perhaps Buddhist pray there giving offering each time I'm there on my coach..
haha so familiar those directions! get to know it during college time, tourism ma! xD but true la. haha.....did you pray correctly? It doesn't matter. As long as you are sincere, I believe your wish will be granted. Toyota is also a popular vehicle choice in Bali. I see them everywhere. oh, this is a very famous four-faced buddha in BKK i guess..
i've always heard about the four-faced buddha in BKK but i didn't know where the place is..
even that time when i was just outside the temple, and i saw lots of people, i still didn't realise that..
until one day when i was chatting with a friend, only i realised that's the place the four-faced buddha is!! I visited Erawan when I was in Bangkok. Very popular among tourist. lina, so Ian Wright or Bobby Chin went there? Yes, I think you can pray for winning lottery numbers! Haha! che-cheh, really? Where is it? wenn, oh really? So you pray to the 4 Faced Buddha? ladyjava, in Singapore? I guess it's not surprising since you can actually get a a mini four faced buddha and put in your home! Wow...your second time here already? :D You sure travel a lot bro. The roads here look like KL? :p Wow...all taxis are toyota camry? How come? Because toyota is much cheaper? Gonna make a trip there during my Bangkok trip in May! wah...one day me must go to bangkok!! i visited the 4-faced buddha 15 years ago. it still looks the same and seems like it's always crowded. I have been in bad luck since childhood. I was born in a slum in Bangkok. I was moleasted on a bus by a strange man when I was 6 years old. My parents did not send me to school but picked my other sister to go to school. I had to study on-line and eventually came to USA with only $100 in my pocket. I have now been living in USA doing odd jobs. My husband cheated on me 5 times and everytime He begged me not to leave him. I am too weak and scare to leave him. I took my husband to Bangkok for a vacation, he fucked 3 prostitutes and passed me diseases. I am now infected with diseases. I have lost my job and Sandy Hurrican hit my house. I am now homeless and have no money. I have rashes in my arms and I broke my front tooth. No one cares. I am at the bottom of the hell right now. I wonder what's next to hurt me. Please help me.